We are a locally owned and operated service and have proudly served Botetourt and the entire surrounding community since 2002. 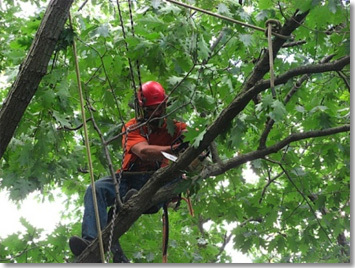 We have nearly thirty years’ experience in the tree care industry. We have hundreds of references available upon request. We have a Certified Arborist; we’re fully insured, we’re fully accredited with the Better Business and are a member of the Botetourt Chamber of Commerce. No matter where you’re located in the Botetourt area and surrounding community, you will be treated as if you are our next door neighbor. You will never be charged for travel time! You will never be overcharged as if you were living out of town. If for some reason we can’t do your work at a reasonable price we will refer you to someone who can. We take pride in being a local service that you can depend on six days a week or seven days a week if you have an emergency. Even before you call us, you can feel assured that we’ll be reasonable, reliable, honest, fast, and dependable. Do your trees get you stressed or worried? Call or Contact today for a Free Estimate and fast same day storm removal service! FREE insurance claim assistance! Look at this seemingly helpless situation this customer found herself in. We can remove a tree like this very quickly because we specialize in Hazardous tree removal. In most cases we will remove a tree like this and clean up the debris on the same day of your phone call or at least by the following day. We will make a temporary roof repair to protect your belongings and satisfy your insurance requirements to protect your home from water damage. We have a Certified Arborist, Bucket Truck, Knuckle Boom Crane and an Articulating Loader with a Log Grapple to make jobs like this go quickly and look easy to the average observer or bystander. A qualified Arborist, the right equipment and a highly experienced ground crew are the key to what makes a great tree service team. You can’t just put a few guys or gals together and make a good crew. First of all a good tree crew must have previous experience and training. Secondly, a good tree crew must work together for many months or even years to work well as an effective and safe tree service team. Most tree companies have a high turnover of employees and never truly develop an adequate team. The Arborist and ground men that work for our organization have been with us for many years and have nearly perfected the fine art of tree removal and pruning. Attention! Most homeowner insurance policies will cover almost all the cost of removing fallen trees laying on a home or other permanent building. The insurance will also pay for all the labor and materials required to repair your home. We will gladly work directly with your insurance agent or adjuster to help you settle your tree removal part of your insurance claim. Our goal is to take care of your tree problem with very little out of pocket expense to you! Hiring the right fully insured tree service professional is the key to settling your insurance claim very quickly with very little out of pocket expense and getting your home repaired as quickly as possible. You should contact your insurance agent to find out more about your coverage before hiring your contractors. Your insurance company should have a 24 hour phone line for emergencies. Removing hazardous trees like the trees pictured below require highly Skilled Arborists and the correct equipment. Using a bucket truck and a loader with a log grapple is just one way that we could remove a hazardous tree from a home or other type structure. Sometimes it is necessary to use our knuckle boom crane if there is sufficient access. Sometimes there is no access at all so we would use one of our Arborist to remove the tree manually. Removing a fallen tree manually from a structure using an Arborist without using heavy equipment is usually much more difficult. It will take longer to remove the fallen tree, but that’s not a problem. Your fallen tree would be disassembled and removed from your structure by one of our trained Arborist; the brush, wood and debris will be chipped, cleaned up and hauled away quickly by our experienced ground crew. 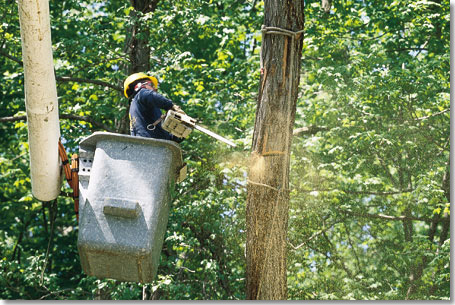 The fastest, safest and most reasonable way to remove or deadwood a large tree is to use a bucket truck or crane. For now, let’s talk about bucket trucks. I modern forestry bucket truck can easily reach the crown of about ninety percent of all trees that have good access. In most cases by using our bucket truck we can remove or deadwood your tree or trees in about half the time it takes to do the same job using an Arborist. Arborist can work faster, safer and longer without taking breaks because it takes much less physical energy while working from a bucket truck. See the images below and you can imagine how much safer and easier the job is standing in the bucket. Who do you want in your trees? 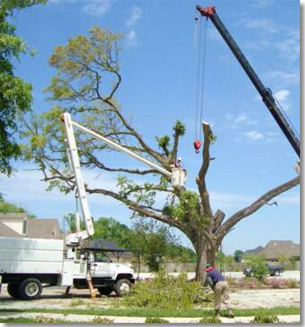 Do you have a tree that may require a crane to remove it from your structure? If so, that’s no problem! We can take care of your most dangerous situations that require a crane! The first thing we would do is send an Arborist by your home to evaluate your tree situation to see what type equipment we’ll need to safely remove your tree. 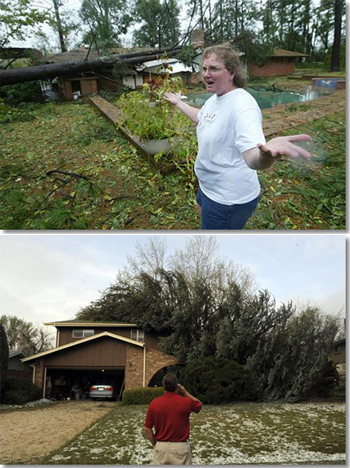 Our Arborist will decide what would be safest and least costly way to remove your storm damaged tree. Our consulting Arborist will be equipped and prepared to properly secure your dangerous tree to prevent damage from any trees that are starting to uproot or fall, but haven’t fell yet. Our Arborist will walk your property and inspect other trees that are or could become a potential hazard. Our estimate and consultation is absolutely FREE! Do your trees need to be pruned or thinned? If so, it’s very important that the Arborist pruning your trees know what species of tree that he or she is pruning. It’s also very important to know the correct time of year to properly prune each of the different species. Many tree species require different pruning techniques due to the different growing characteristics of that species. Trees need to pruned and or fertilized occasionally to keep them in good health. Trees located in an urban setting tend to have problems due to competition from other trees, shrubbery and grasses. Trees also have a problem getting enough water due to soil compaction, pavement and other structures covering the ground where their roots would normally grow. Proper pruning, thinning and or fertilization helps relieve some of the stress that trees suffer due to growing in residential neighborhoods. Please contact us if you need to have one or our Arborist stop by your home or business to evaluate your tree care needs. There is no charge for our consultation or estimate and you’re under no obligation what so ever to use our service! Please call or contact us today! We have same day, next day stump removal. 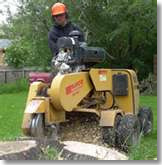 We can grind the largest of stumps with our large stump grinder and we can get to the most difficult of stumps with our portable stump grinder. Either machine can grind extremely large stumps. We also do lawn repairs to repair stump holes using topsoil, seed and straw. We only use the highest quality seed and straw. Please call us today so we can quickly remove that ugly stump from your yard!